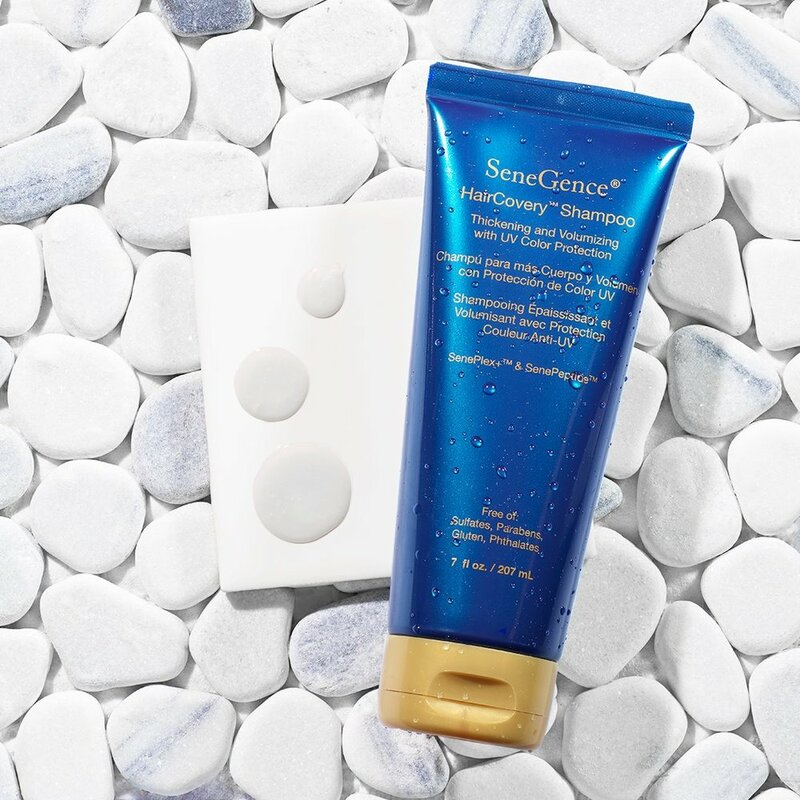 Enhance volume, thickness, strength, and shine with a revolutionary hair care system developed by SeneGence®! The HairCovery HairCare system works to revive hair to its healthiest state from scalp to ends. Safe and beneficial for color-treated hair, this collection helps improve volume, shine, and manageability using SenePlex+TM and SenePeptideTM, and nourishing vitamins and botanicals. After six years in development, our HairCovery system is here! The shampoo is step one in the HairCovery system. It helps to revive dry, dull, and thinning hair to reveal healthy, luscious locks. Key volumizing ingredient CapixylTM improves hair growth cycle to help enhance hair density by stimulating the hair follicles. In the study completed, after four months - participants had an increase of 79% new hair growth per square centimetre! Step two of HairCovery system. It is formulated to protect and revitalize hair while also helping to improve hair texture, moisture, and shine. Key volumizing ingredient CapixylTM improves hair growth cycle to help enhance hair density by stimulating hair follicles. This serum is step three in the HairCovery system. It is a powerful hair serum formulated to help enhance the thickness, strength and volume of your hair from scalp root to hair tip. This is meant to be used as a scalp treatment and is applied directly to the scalp, not the hair itself.